Ritual offering, survival food, index of sophistication: what's pagan about northeast India's penchant for wild meat? It's the second week of March 2002. Morum, the annual Apatani spring festival, is in full swing at Hapoli, district Ziro, Arunachal Pradesh. The feasting includes voluminous amounts of barking deer meat. 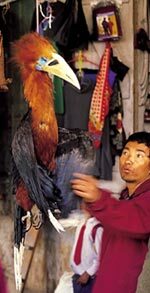 Flesh of common hill partridges, red jungle fowls, Assamese macaques and great barbets have also found their way to the Apatani platter; capped langur s are being sacrificed to propitiate the community deity. In the gaiety, I almost overlook these violations of the Wildlife Act, 1972 as a once-in-a-year occurrence. But the ecologist in me prevails: I decide to probe more. Dani Jenny, my local host, is an eager help. "Hunting for wild meat is integral to our culture," she says. Others in Hapoli corroborate. With my colleague Rahul Kaul and armed with a questionnaire, I then travel to villages all over lower and upper Subansiri districts in Arunachal, asking people about wild meat extraction. It's no easy quest; the tribals do not like outsiders snooping into their dietary and cultural habits, and a few do know that wild meat extraction is illegal. But the reticence of some finally gives way: we learn that the white-bellied rat is the most commonly killed mammal, followed by the barking deer and the Assamese macaque. The hill partridge, the great barbet, the kalij pheasant and the red jungle fowl are the most commonly extracted wild birds. The religious rituals of the Apatanis include generous offerings of smoked three-striped and five-striped squirrels. But Apatani rules dictate that women cannot partake in much of this feasting. For, wild meat supposedly whets their sexual desires. Our curiosity then takes us to Nishi villages in northeastern Arunachal. We proceed with much trepidation: the Nishis are known to guard their privacy even more resolutely than the Apatanis. But in villages Nishis and Hills Miri in the lower and upper Subansiri districts, we find help and manage to get our questionnaire circulated amongst quite a few households. Barking deers, wild boars and primates are the most commonly hunted animals, we discover. Suspecting eyes Meanwhile, our travels continue to be dogged by suspicious local people. In villages of Dafla tribes, wary religious leaders subject us to serious inquisition. We pretend innocent curiosity, even while casting furtive glances at the Himalayan black-bear skin caps of these leaders; some of these headgears are even bejewelled with pairs of the tail feathers of the large racket-tailed drongo and the lesser racket-tailed drongo. Our act pays off: some Daflas confide their love for great barbet meat. Others tell us that the skin of the capped langur is prized by members of their community to make sheaths for their traditional daggers, davs . "The Daflas hone their hunting skills at an early age by slaying rodents and small birds for fun," says Taya Tamin of Taya Shimla village. This is a common practice among the little ones of quite a few tribes in northeast India, we learn gradually. Our Dafla interlocutor also tells us that modern firearms have given a big fillip to hunting. "All classes of our people love to hunt hornbills, especially the rofous-nacked variety," he adds. With curiosity giving way to disquiet, we move to Aizawl district in Mizoram. Assamese macaque, wild boars, bandicoots and barking deers are the most hunted mammals here; the blue-throated barbet, the great barbet and the imperial wood pigeon are the commonly killed birds. But Mizos don't kill just for food: bat meat is supposed to cure asthama, while monkey flesh is associated with relieving delivery pains and also in the development of the foetus in the mother's womb. Kohima district in Nagaland is our next stop. "The Angami tribes people here are voracious wild meat eaters," Metha, a forest officer of the local forest division, tells us. The households that respond to our questionnaire corroborate him. The wild boar is the most hunted, followed by the serow and the barking deer. The Angami hunter also kills galliformes and bulbuls. They also believe that hoopoe meat helps in curing male impotency. Our quest then takes us westward to north Bengal and Sikkim. "The Nepalese people here are experts in snaring wild animals," says K S Pradhan of village Rimmbick in district Darjeeling. A wide range of species including the barking deer, wild boar, serow and the satyre tragopan are killed for food, our other respondents reveal. Medicinal usage also takes a toll of wildlife: the flesh of the Himalayan bull frog and white collared black bird is believed to cure asthama, while monkey meat is regarded as effective medicine against tuberculosis. But is all hunting for self-consumption? We sneak into a few open markets in the urban northeast to find out. These were teeming with wild meat sellers. At Kohima, barking deer sold for Rs 120 a kg. A red jungle fowl was priced at Rs 180, a kalij pheasant sold for Rs 140, blyth's tragopan for Rs 300 and porcupine for Rs 900. We pried a little more and found many other animals sold for meat: an Indian pangolin cost Rs 1,100, an otter between Rs 800-900, while hoopoe sold for Rs 850. At the market in Hapoli a kalij pheasant sold for Rs 110, a great barbet for Rs 60-80, the wild boar cost Rs 110 a kg, rufous-nacked hornbill Rs 850, civets were priced between Rs 600 and Rs 900 and the barking deer sold for Rs 110 a kg. Markets in Itanagar were also well-supplied with wild meat from the remote areas. "All classes of our people relish wild meat," informs Jenny. "Those who have migrated to the cities have not lost their taste for it," she adds with an impish smile. The survey left us a bit restless, more so because the region is regarded as among the world's biodiversity hotspots. But destruction of wildlife can be checked. Working with the religious schools and communities can control hunting. There are four main wild meat users in the region; each of these should be tackled differently. Subsistence hunters depend heavily on wildlife for food, while other consumers (such as city and town dwellers) prize it for taste. There is also much cultural significance to this dietary pattern. Any change in this behaviour requires strict enforcement of law in the short-term. But ultimately, suitable protein alternatives and public awareness would be needed to wean people away from wild meat. In fact, snails and fish have emerged as popular protein alternatives in Mizoram. But this would not be enough to check activities of the commercial hunters. Their business should be made unprofitable. This can be done by raising their costs through strict enforcement of law (confiscation and fines). Women traders are the critical link between consumers and the commercial hunters. Many of them also sell other agricultural products and/or non-timber forest products. But wild meat is the most lucrative of their businesses. High consumer demand and poor law enforcement keeps the cost of this activity low and their earnings high. But if costs are raised (through confiscation and fines) and other economic opportunities present themselves, most would change their business. This would break the critical link between commercial hunter and consumer. At the same time new traders should be prevented from venturing into the business. The government should also revise the current licensing system for arms and ammunition in the northeast. The gun and rifle licenses that are issued to people for their self-defence must be terminated. Instead fresh pistol licenses should be issued. This could effectively reduce the shooting range of a hunter and in the process bring relief to large game. Air guns should be licensed to reduce pressure on small birds. In order to monitor the progress of these strategies, market and consumption surveys should be initiated. Ecological monitoring must include periodic wildlife surveys in the different land use zones. Restocking wild animals in potential empty and/or low animal density forest patches must be an essential component of any conservation plan for the region. Ecological and socio-economic data must be integrated into geographical information systems area-maps. Hilaluddin is a member of the International Union of Conservation of Nature's sustainable species use group. He has been studying the sustainability of wild meat harvest in the Himalaya for the past three years This could effectively reduce the shooting range of a hunter and in the process bring relief to large game. Air guns should be licensed to reduce pressure on small birds.